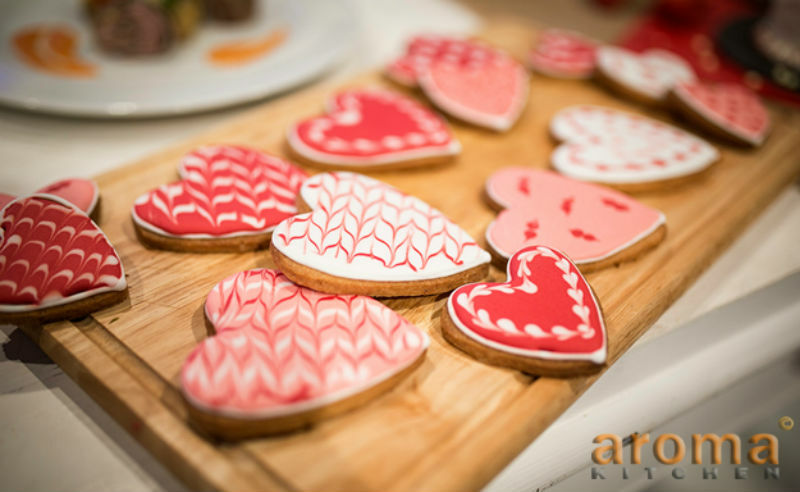 Spread the love with these heart-shaped cookies this Valentine's Day! In the bowl of a stand mixer fitted with the paddle attachment, cream together the butter, sugar and salt at medium speed until light and fluffy, about 3 minutes. Add the egg yolk and beat until fully incorporated. Mix in the whole egg, vanilla and optional almond extract. Beat until full mixed. Add the flour, then beat at low speed just until combined. Be careful to not over-mix. Divide the dough in half and wrap in plastic wrap. Store in fridge until firm, at least one hour. Preheat oven to 180`c. On a floured work surface, roll the dough to 1/4-inch thick, sprinkling with additional flour as needed to prevent sticking. Use cookie cutters to cut into shapes and place on parchment or silicone-lined pans. Bake until cookies appear dry on the surface and are light golden brown on the edges, about 10 minutes (or a few more for larger cookies). Let sit for 2 minutes before removing from cookie sheets. Allow to cool completely on cooling racks before decorating with icing.